Brotherhood crushed in 1954: Could history repeat itself in 2012? Nasser's revolutionary regime crushed the Muslim Brotherhood in 1954. Given the Islamist group's recent political ascendancy, might the same scenario be repeated in 2012? In response to a statement late last month by the Muslim Brotherhood blasting the performance and questioning the sincerity of Egypt's military rulers, the Supreme Council of the Armed Forces (SCAF) issued its own statement, hitting back at its critics and defending its intentions. Last month saw the Brotherhood's Freedom and Justice Party (FJP) call for the dissolution of the incumbent government of Prime Minister Kamal El-Ganzouri, asserting that the latter had "failed to fulfil its duties" during Egypt's ongoing, post-revolution transitional phase. The SCAF, however, has insisted on keeping the interim cabinet in place until the end of the transitional period, when an elected president will – theoretically, at least – assume executive authority. The Brotherhood then suggested that the current government was being kept in place in order to "abort the revolution or manipulate upcoming presidential elections" slated for 23 and 24 May. In a veiled a threat to Egypt's leading Islamist group, the SCAF responded by urging Egyptians "to be aware of the lessons of history, to avoid past mistakes that we don't want to return to, and to look instead towards the future." Most political observers interpreted the statement as a reference to the events of 1954, when a brief honeymoon between then-president Gamal Abdel Nasser’s Revolutionary Command Council and the Brotherhood ended in a wide-ranging crackdown on the group. The Brotherhood was subsequently outlawed for more than 50 years – until last year's Tahrir Square uprising. Nasser's Free Officers movement, which launched Egypt's July 1952 Revolution, was composed of junior army officers committed to ousting the Egyptian monarchy and its British handlers. Nasser founded the group following Egypt's defeat in the 1948 Arab-Israeli War, before becoming president in 1956. Nasser, along with Mohamed Naguib, Egypt's first post-monarchy president, led the revolution. Latifa Salem, history professor at Benha University, explains that Nasser formed the Free Officers movement after looking at every other party around at the time, "but couldn't find what he was looking for, since he had a different ideology. That’s why he formed the movement." Salem went on to point out that the Free Officers included members of all political backgrounds, including Wafdists, leftists and Islamists. Mohamed Faeq, a Free Officer and foreign minister under Nasser, dismissed claims that the Muslim Brotherhood had played a major role in the revolution. "The claim that the Muslim Brotherhood was a huge part of the 1952 revolution is a myth," he said. "The truth is that there were two or three Brotherhood officers among us." From the outset, Nasser's revolution was met with wide popular support among different sectors of society. "The Muslim Brotherhood was among those supporters, but not as a majority," said Faeq. In 1954, the Revolutionary Command Council demanded that all political parties be purged of anyone with links to the former ruling regime. Since this did not happen, however, the council simply dissolved all political parties. The council initially decided not to dissolve the Brotherhood, which was seen as a religious group rather than a political party. In the wake of the revolution, Nasser elected Brotherhood members as ministers in the newly-formed government. These included Minister of Justice Ahmed Hosni and Religious Endowments Minister Ahmed Hassan El-Bakoury. The Brotherhood's authoritative Guidance Bureau, however, insisted on selecting ministers themselves, demanding the right to withdraw and appoint whatever government ministers it found suitable – a position refused by the Revolutionary Command Council. Nasser also asked the Brotherhood to disband its clandestine armed wing, believed to have been responsible for a number of violent operations before the revolution. The Brotherhood, however, refused to acquiesce. This is when the rift opened up between the group and the revolutionary council. "Nasser...sensed that the Brotherhood would be a threat to the country," said Salem. "So he decided to dissolve it." Following a failed attempt on Nasser's life in 1954 that was widely attributed to the Brotherhood, the group was formally outlawed. Thousands of its members were imprisoned for years, while others faced the death penalty. In response to the assassination attempt on the president, the Brotherhood lost considerable popular support. 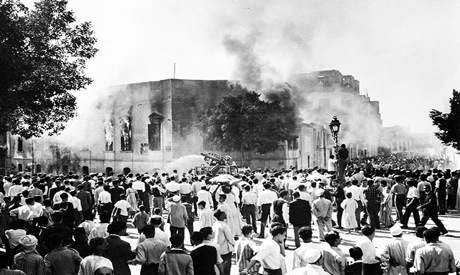 At one point, crowds gathered outside the group's Cairo headquarters, eventually setting it on fire. Naguib, by contrast, had not been adverse to sharing power with the Brotherhood. According to historian Saber Arab, one of the main reasons for Naguib's overthrow was his alliance with the group. "The Revolutionary Command Council had a more open vision regarding women, Copts and social justice, different than that of the Brotherhood, which was supported by Naguib," Faeq said. The Muslim Brotherhood also opposed Egypt's secular-oriented constitution, drafted in 1954. Although the charter was never applied, it remains highly respected by constitutional scholars. Salem believes that the difference between the Muslim Brotherhood of the post-1952 revolution period and the Brotherhood of today, following Egypt's 2011 Tahrir Square uprising, is that, back in the 50s, Nasser knew all too well how to crush the group's political pretensions. Today's ruling SCAF, by contrast, does not. According to Arab, the SCAF's failure to manage Egypt's transitional phase since Mubarak's February 2011 ouster is the main reason why a single, dominant party – the Brotherhood – is now emerging to take the place of the ousted regime. Salem and Arab both agreed that the root of Egypt's current political crisis is that the constitution should have been written prior to parliamentary elections – not after. What's more, the Brotherhood has become even more powerful since becoming again active under late president Anwar El-Sadat in 1970s. Indeed, the number of Brotherhood members countrywide has grown considerably over the past 40 years. Notably, despite tough economic circumstances and rising poverty rates, Egypt became a capitalist country during El-Sadat's tenure, moving farther and farther away from Nasser-era socialism. "Most, if not all, of the leading members of the Muslim Brotherhood are capitalists," noted Salem. The situation today, by contrast, has helped the Brotherhood to attract new members by extending financial and moral support. "This was especially the case under Mubarak's police state," Salem said. The Brotherhood's use of charitable work to attract members and garner sympathy was also a factor during parliamentary elections late last year, Salem said, and could be a factor during upcoming presidential elections – slated for May – as well. In the wake of last year's revolution, many Egyptians – politically active and otherwise – sympathised with the long-oppressed Brotherhood. This sympathy was bolstered by the group's promise that, despite its large numbers and financial resources, it would refrain from dominating the post-revolution political scene. Judging by the group's latest actions, however, this has not been the case. The Freedom and Justice Party (FJP), established by the Brotherhood in the immediate wake of the revolution, now holds just under half of the seats in Egypt's People’s Assembly and almost three quarters – along with the Salafist Nour Party – of the newly-formed Constituent Assembly tasked with drafting a new constitution. And, most recently, prominent Brotherhood member Khairat El-Shater announced his intention to contest Egypt's presidency. The abrupt decision to field a presidential candidate from within the group's ranks has stirred heated debate both inside and outside the Brotherhood. According to Arab, the FJP takes its orders directly from the Brotherhood's supreme guide. If this is, in fact, the case, Egypt's political institutions – including parliament and the Constituent Assembly – are effectively being run by the supreme guide, said Arab. "The power now wielded by the Brotherhood makes a repeat of the 1954 scenario unlikely," said Wahid Abdel Meguid, analyst at the Cairo-based Al-Ahram Centre for Political and Strategic Studies. "If the Brotherhood and the SCAF eventually come to blows, both sides would inevitably lose." This is a tendentious analysis which seeks to expalin the non-Islamist camp's failure in the election. Indeed, why did all these big-name liberals and leftists and secularists fail where the Islamists suceeded? This articvle fails miserably to answer the question. The answer is clear: the people of Egypt trust the Islamists, and don't want to be ruled by foreign ideologies.